At 1:12 into Stargate SG1 S9E16, Teal'c is seen firing a weapon more like a weapon of the Tau'ri. But I don't recognize it from earlier missions...He usually uses the Staff Weapon. 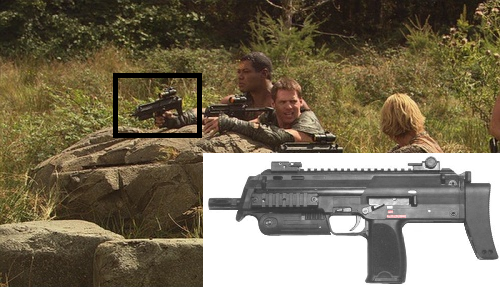 According to the Internet Movie Firearms Database, it's a Heckler & Koch MP7 (with added sights). I've seen him use the same P90s the rest of the team uses, but this time they had different gear. Is the Chappa'ai vortex ionized or toxic?